Coseley’s Tommy Ghent thinks he’ll be ready to get into the title chase after he takes part in his first six-rounder for over four years. 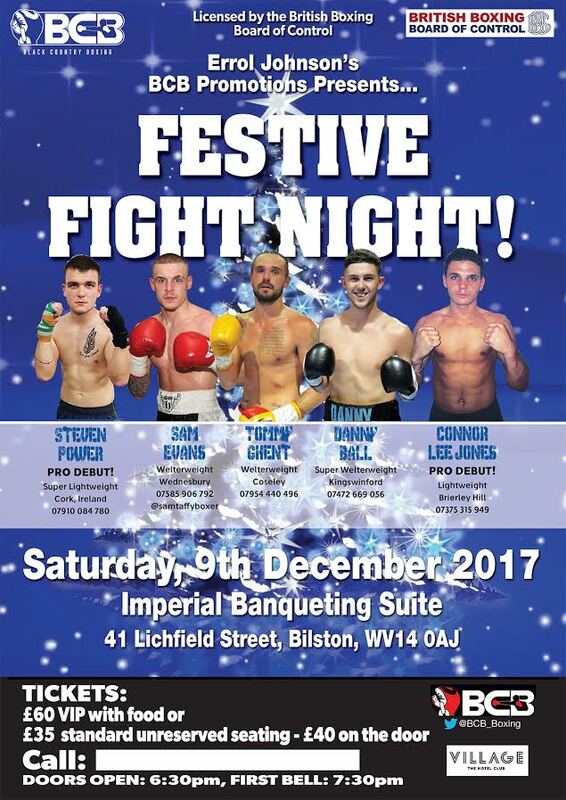 Ghent goes in over the longer distance this coming Saturday evening (9th December) for the first time since outpointing Jay Morris in June 2013 when he appears on BCB Promotions’ ‘Festive Fight Night’ at the Imperial Banqueting Suite, Bilston. The talented welterweight didn’t box in a paid ring again until July, where he returned to action with a points victory over Teodor Nikolov. Two potential outings have fall by the wayside since then, but the 25-year-old will now see action against Danny Little this weekend. Ghent was a bright prospect when he turned pro, aged just 19, in 2011 and has boxed under the David Haye’s Hayemaker and Matchroom banners. “It’s been a tough camp,” Ghent told bcb-promotions.com. “I’m feeling good though and I’ve got a job to do, then I can start pushing for something. I’ve got the potential to get right up there. “I know you are only as great as your last performance, so I need to put on a show this time. In the last one, it felt like I was making my debut again. “I wasn’t relaxing and I felt a bit hesitant to throw my shots, but I started to come out of my shell after a couple of rounds.“I’ve had a shoulder injury since then and a show I was on got called off, but it’s good I’ll get another fight under my belt before the year is out. “I think I perform better when lads engage with me, I hate chasing opponents around. I’d like the rounds but you don’t get paid for overtime, either. He’s coached by his older brother Richie Ghent, who also leads Kingswinford’s Danny Ball and Irishman Steven Power into battle. The card is completed by Wednesbury’s Sam Evans, who is now under Errol Johnson’s wing, and fellow Johnson-trained prospect, Swadlincote’s Connor Parker. Tickets for the show are still on sale, by contacting the boxers on Facebook or online at iboxingtickets.com. They are priced at £35 standard and £60 ringside, the latter option to include food. It will be £40 entry on the door come fight night.